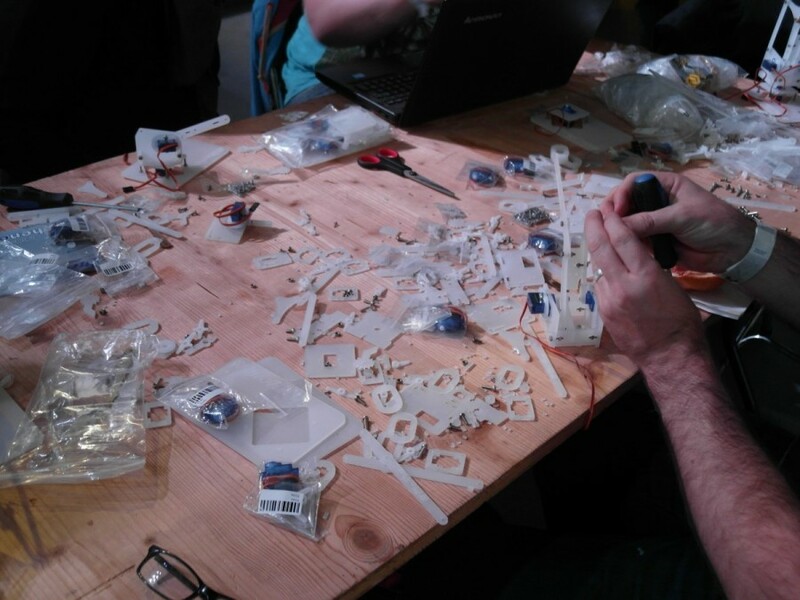 At 13.11.14 there was an embedded workshop and the hackaday price party in munich/germany. This was the first hackaday price, you could send in your hardware hacks and the winner got a trip to space (or the equivalent money). 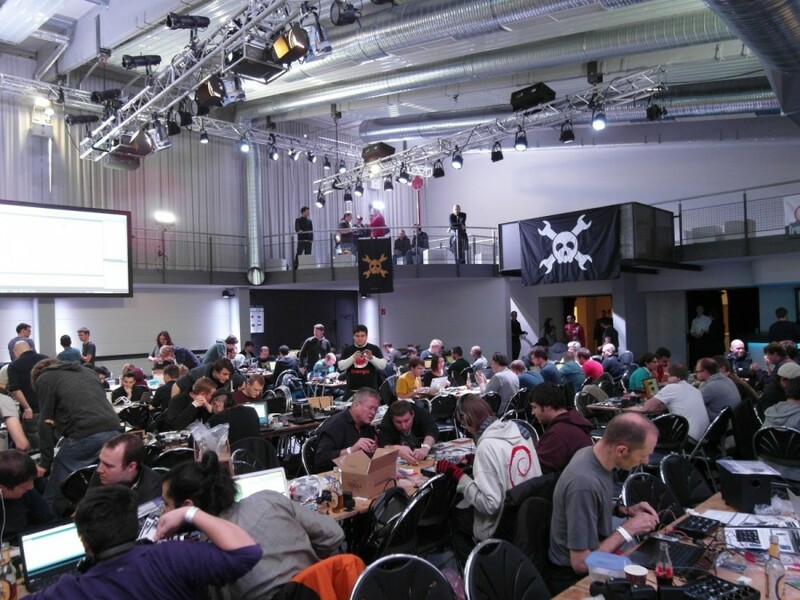 The hackaday party was in munich because of electronica. Electronica is a trade fair for the electronics industry at the "neue Messe" munich. 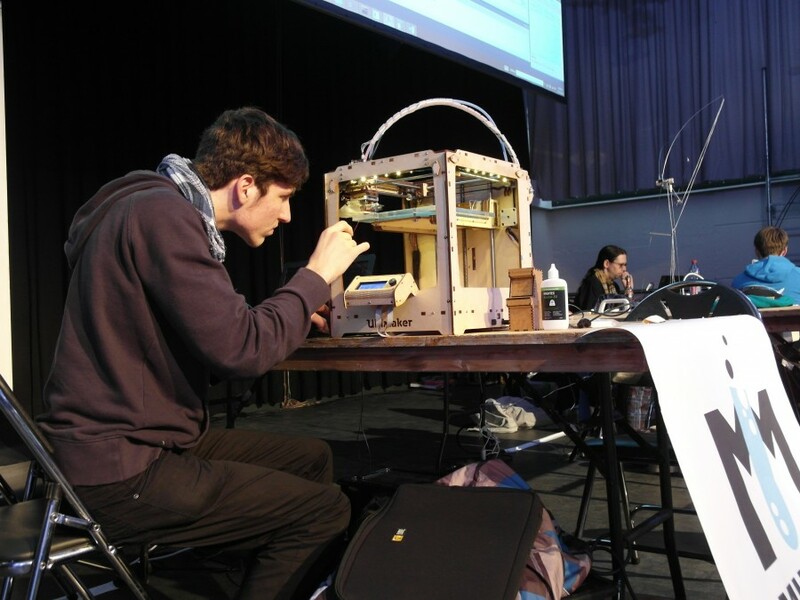 I did know that this would be a trade fair full of salesmen in suits and componentes the usual hobbyist is not really interested in but anywhow, I could combine the hackaday party with the electronica to make a nice 2 day trip. First day I spend at the electronica. Look at this intro, isn't it just beautiful? Of course I was mainly interested in the embedded part of the fair. Besides that I walked around and started conversations whenever I saw something I don't know. For example there are companies that offer water sprayer like the ones you know from the supermarket which are spraying the vegetables. The idea behind that is that you increase the humidity to make the air more conductive and take away static electricity. Interesting! Haven't seen this before. A very interesting booth for me of course was Cypress. The PSoC 4 was released with an inbuilt Bluetooth-Module. Wow! All you need is an antenna. I think this is a very good start for IoT (Internet or Things) and PSoC, I really hope they come up with inbuilt WiFi too, in that case this chip has the potential to be THE big thing. There is even some unofficial information about USB on the PSoC4.... wohoo! Only show blocker might be that Cypress chips are not that well known. You never have been in touch with PSoC? Then get a PSoC 4 CY8CKIT-049, its only 4€ and the Software is free! Only drawback of this kit is that you have to flash it using a UART bootloader and there is no debugger on the board but hey... 4€! If you want to have the first touch experience a bit more advanced, you should go for the CY8CKIT-042 PSoC® 4 Pioneer Kit which is not only providing an onboard programmer, SWD debugger and Touchpads but its also arduino shield compatible. I just ordered an Arduino compatible FPGA (unfortunately Xilinx :/) so I easily can hook it up to the PSoC. To be honest... I don't like the arduino form factor. And the pin layout on the Pioneer Kit is a pain. I understand why the pins are at certain locations but... its confusing. At least there is the pinout printed to the PCB. A bit of a disappointment was the ST booth, again they told me that there will be an own IDE soon and that the toolchains are working nicely and its all good... no it's not like that. Come on ST, there are so many smaller competitors who have some really nice IDEs, you can.... you have to! ... do better. I don't want to have set up a toolchain manually for a day and in the end it does not work or not reliable. If you sell the chips you have to provide the tools to use them. To come to an end for the electronica. It was interesting but I don't think I'll go there again. That is because I am mainly into embedded systems and less into hardware design, neither I am a distributor or company, it's simply not meant for private persons. I personally do prefer the embedded world in Nürnberg/germany. 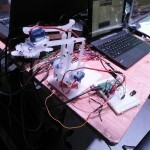 The next day I was at the hackaday party. I had no idea what to expect and also I didn't know anybody. So I just went there and wow! That was awesome! First thing I noticed, very nice location (Kultfabrik München) with very clean and professional set up. Next unbelievable thing, everything was free!!! Even the food and the drinks!! That is something I really haven't expected. 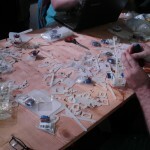 As I was not enrolled into any of the workshops I walked around and checked what the people are working at. 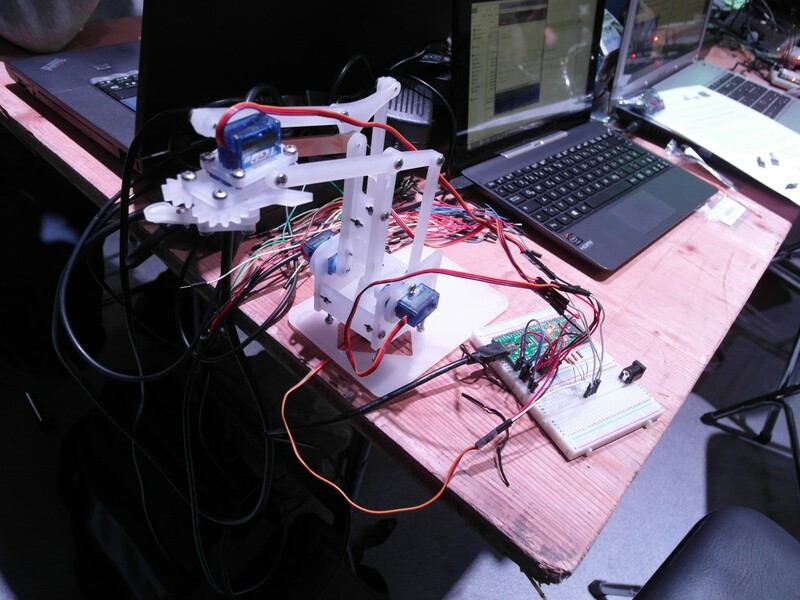 Hackaday provided devkits, roboter arms, synthesisers, tons of passive components and all kind of things. In the end people could take everything with them, for free (beside the synthesiser). I was asked which Shirt size I have, and boom... new T-Shirt. for free... I didn't spend a single cent that day. After the workshops the program started with some presentations and talks. In the meantime we had the chance to visit the "computeum", which was just around the corner, Hans Franke, the retro-god gave a small speech about the history of computers which you can see below, very interesting! I wish I would have the time to start with C64 or Amiga programming. This is just so fascinating. What developers build back in those days with the tools available is extremely remarkable, they knew how to do things efficient and clever, yes I am talking to the 40MB mouse driver guys! As a side node, Bill Herd visited this blog and he liked it. After the last talk about a Keyboard hack by [sprite_tm] which was extremely interesting and entertaining (and can be found here) we came to the last official point on the agenda which was the announcement of the hackaday prize winner. You can read about the finalists, and the winners here. SatNOGS won, a global satellite tracking and communication system. It had been my favorite but that was before somebody told me what exactly the RamanPi is doing. Anyway, congratulations to the winners! 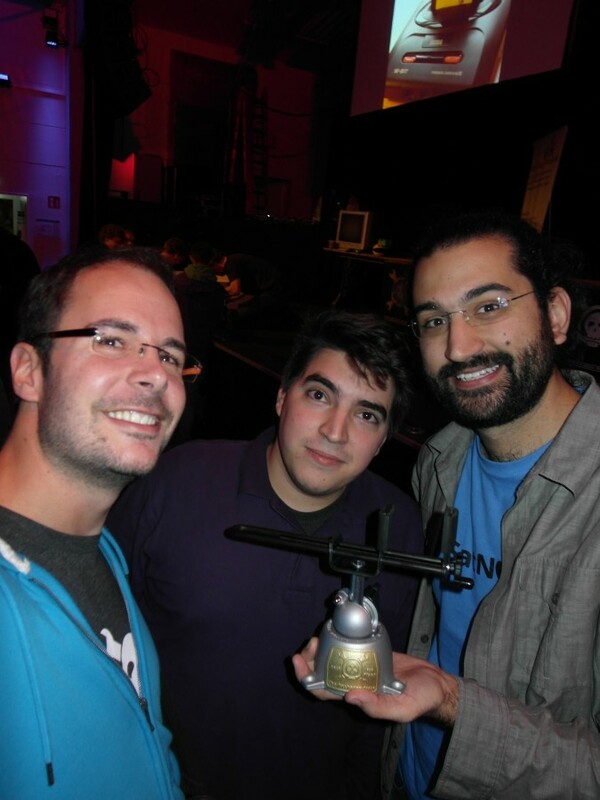 They deserved it, check out my #hackadaypriceselfie with the winners and the trophy. and all this with ~250 participants from which ~ 100 got kicked because they violated the rules (which not had been that tough at all) or didnt come up with serious ideas. That which means that nearly 1/3 of the guys attending the hackaday price won at least $1000. The guests of the hackaday party got stickers, batches, books and other things (like a 30% voucher for the hackaday shop). 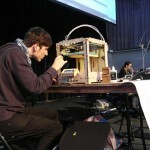 After summing up the costs the whole event and the hackaday price I became skeptical about the whole thing. I mean of course they earn some money with the blog and the shop but I assume its not close to the expenses. So I asked Steve Flagg, the Founder and CEO of supplyframe and the owner of hackday. His answer to my question why he is spending this much money was very simple: "I don't know yet!" Thanks again to the hackaday team for the great day.